This past weekend saw the Big Bite Bacon Fest in Long Beach; my recap is forthcoming. In the meantime, here’s a sneak peek. This Saturday, August 8th, I’ll be attending LA Weekly’s first Burgers & Beer event at the LA Coliseum. Tickets are $75 to enjoy 40+ burgers and 30+ beers for three hours! For a very limited time, you can enter to win a 4-ticket Buddy Pack from Reserve! Post a photo on Instagram of your favorite burger from any Reserve restaurant, follow @Reserve, and include #ReserveBurger and #LABurgers in the caption. Winner will be announced by August 7th. Good luck! This Sunday, August 9th, Stu and the Kids will take place at Vibiana in DTLA. 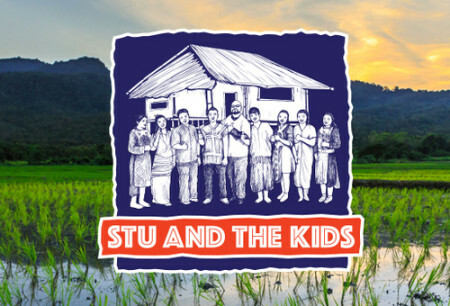 This fundraiser benefits underserved and orphaned Hill Tribe children in Northern Thailand. The event will feature Neal Fraser of Redbird, Eric Greenspan of Maré (review), Walter Manzke of République (review), and more! Tickets are $95. On Tuesday, August 11th, Los Angeles Magazine celebrates its taco-centric July issue with a social hour and preview of Petty Cash Taqueria‘s new Arts District location, opening soon, with chefs Fabian Gallardo & Walter Manzke, and guest chefs Wes Avila (Guerrilla Tacos) & Carlos Salgado (Taco Maria) preparing a special menu! Find out more about the event, including how to attend, on LA Mag’s event page. Hope to see you there! On Saturday, August 15th, Del Rey Deli Co. will be hosting their monthly Del Rey Supper Club. (My review of the extended supper club meal I had last month will drop by the end of this week.) Call 310-439-2256 for more info and to reserve a seat! Del Rey Supper Club's 'Jidori Chicken, Leeks' at Del Rey Deli Co.
On Thursday, August 20th, Ceviche Project will be hosting their monthly seafood-centric pop-up dinner, paired with DeLeón Tequila’s handcrafted cocktails, at the Skybar in the Mondrian Hotel in Hollywood. (My review for last month’s pop-up dinner should be up by the middle of next week.) Tickets for this month’s dinner are already on sale! There are lots more food festivals, pop-ups, and other events happening this month, including two blockbusters: the Los Angeles Food & Wine Festival, August 27th through 29th, and LA Times’ The Taste, September 4th through 6th (technically not August, but close enough). I’m attending the latter, and hoping to attend the former! Will preview those events later this month. Feel free to let me know about any other events in comments here or on Twitter!